Am I the only one who likes hippie fashion? Didn’t think so, we all know a hippie or two nowadays however it was the 60’s era that really started the trend paving the way for rebellious teenagers and wacky hippie adults. The key principles of being a hippie are freedom, natural living, living in communities of like-minded people and unleashing your spiritual and artistic sides and so this heavily reflects in the type of clothing they wear. 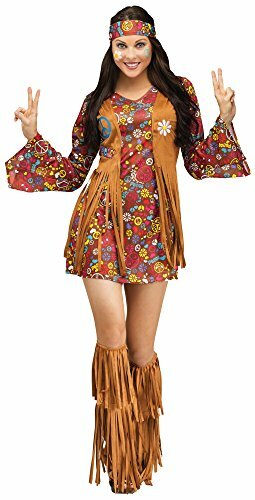 Below I will show you how to create your very own DIY hippie costume for festivals such as Coachella or Halloween parties including tie dye shirt, floral headband and everything else. First start off with creating a simple tie dye shirt, hippies are known for using psychedelic bright colors in their clothing and so tie dye is the perfect choice. Get a simple white shirt from Walmart that’s cheap so you don’t mind messing it up and a tie dye kit and get to work. If all that jazz sounds like a lot of work to you why not choose a premade outfit that is great for those in a rush. There is a choice for both men and women. The men’s outfit includes all you will need including: wig, glasses, chain, shirt. Just add your own ripped jeans and suitable footwear such as sandals. Just add your own boots that will be disguised by the boot covers and you’re ready to go. You can’t be a hippie without a floral headband of some sort so that’s what we’ll move onto next. It’s easy to find floral headbands at the dollar store if you check back as new stocks cycles in. Otherwise you’ll need floral wire and tape, gather your choice of bright flowers and slowly begin taping each one to your wire headband until you like the look of it. Along with bright colors of your clothing your face will need to be bright also. Start with a white base on your eyelid before applying any bright color of eyeshadow to it. Finally go underneath your eyelids with an equally bright but contrasting color. This video is a quick watch at under 3 minutes and will show you everything you need for the outfit itself aswell as pointers for the makeup side of it too. For hair there are plenty of different style you can try. Either keep your hair out and don’t brush it for that ‘just got out of bed’ bohemian style look or incorporating color into your hair by dip dying or adding ombre clip on extensions. Don’t forget as a final accessory adorn your arms with as many hippie bracelets and bands as you can get your hands on. Then get an old pair of jeans that you no longer need and make rips along the knees. Finally footwear, this can be sandals or as above boots with boot covers. These costumes were just everyday fashion back in the day.